Illegal dumping removal. Three words that stir up a whole lot of dread. When you’re a property owner, this is something you dread dealing with. It’s a bane on society and a shame that it even happens. But, it does occur from time-to-time. Unfortunately, it’s the property owner who must ultimately deal with it. While there are proper agencies and other policing entities, this is just not enough to deter some people from illegal dumping. They don’t want to incur the cost and/or spend the time to dispose of waste the right way. Which means that you become the one who takes responsibility. Illegal dumping does more than leave an unsightly pile of debris and trash behind. And, all that stuff is detrimental in more ways than one. Of course, it’s unsightly and plain messy. But, it also poses a safety hazard to anyone who goes near it or must properly dispose of it. Also, it poses a danger to the environment. Since most of the materials are non-organic, it’s dangerous. Then, there’s the matter of it being a possible health hazard. If it contains any hazardous materials, it’s definitely unsafe to humans, as well as animals. All of this, not to mention the fact that it’s a possible code violation. Which means it could be a financial liability on top of everything else. Document everything. Although it’s your responsibility to clean up the mess, you should document it, first. Take a bunch of picture of the mess, as well as the surrounding area. Also, take notes to have for future reference. Post signs on the property. Next, you should post “No Dumping” and “Private Property” signs in conspicuous locations. Put these around the parameter and any dedicated entry/exit points. Call a junk removal service. Finally, bring in an illegal dumping junk hauling service to quickly cleanup the mess. 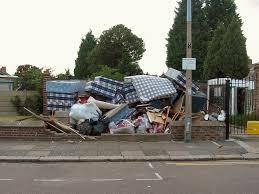 When you need illegal dumping removal done, just phone 800-433-1094 or visit Junk Garbage Removal.